At Paviljoni bungalovi Kacjak, enjoy a satisfying meal at the restaurant. Breakfast is available for a fee. With a stay at Hotel Ad Turres in Crikvenica, you'll be near the beach, within a 5-minute drive of Kvarner Gulf and Crikvenica Town Museum. This hotel is 1.5 mi (2.5 km) from Church of St. Anthony of Padua and 1.6 mi (2.6 km) from Bronze Fisherman Statue. Make yourself at home in one of the 74 guestrooms. Complimentary wireless Internet access keeps you connected, and satellite programming is available for your entertainment. Private bathrooms with bathtubs feature complimentary toiletries and hair dryers. Conveniences include phones, as well as desks and blackout drapes/curtains. Make yourself at home in one of the 3 individually decorated guestrooms, featuring kitchens with full-sized refrigerators/freezers and ovens. Flat-screen televisions with digital programming provide entertainment, while complimentary wireless Internet access keeps you connected. Conveniences include safes and desks, and housekeeping is provided on request. When you stay at Hotel Vila Ruzica in Crikvenica, you'll be near the beach, within a 5-minute walk of Kvarner Gulf and Crikvenica Beach. This hotel is 0.7 mi (1.1 km) from Crikvenica Town Museum and 0.8 mi (1.3 km) from Church of St. Anthony of Padua. Take in the views from a terrace and make use of amenities such as complimentary wireless Internet access and a reception hall. Try your luck at the casino and enjoy other recreational amenities, which include a nightclub. Additional amenities at this hotel include complimentary wireless Internet access, gift shops/newsstands, and a hair salon. Enjoy recreation amenities such as outdoor tennis courts or take in the view from a garden. Additional features at this apartment include complimentary wireless Internet access and a picnic area. Take advantage of recreation opportunities such as outdoor tennis courts or take in the view from a terrace and a garden. Additional amenities at this hotel include complimentary wireless Internet access and wedding services. This hotel enjoys a wonderful setting overlooking the bay, in Crikvenica. The hotel is located just a short distance away from the city centre. A number of shopping, dining and entertainment venues can be found nearby. Guests will find themselves close to a host of attractions in the area. This charming hotel welcomes visitors with warm hospitality and excellent service. The guest rooms are superbly designed, featuring refreshing tones and a tranquil ambiance. Guests can enjoy a delightful breakfast at this hotel, for a great start to the day. The hotel also features a restaurant, offering delectable cuisines. Guests can enjoy a refreshing swim in the pool, or sit back and enjoy the seasonal entertainment programme. When you a stay at Hotel Esplanade in Crikvenica, you'll be on the beach, within a 5-minute walk of Crikvenica Beach and Bronze Fisherman Statue. 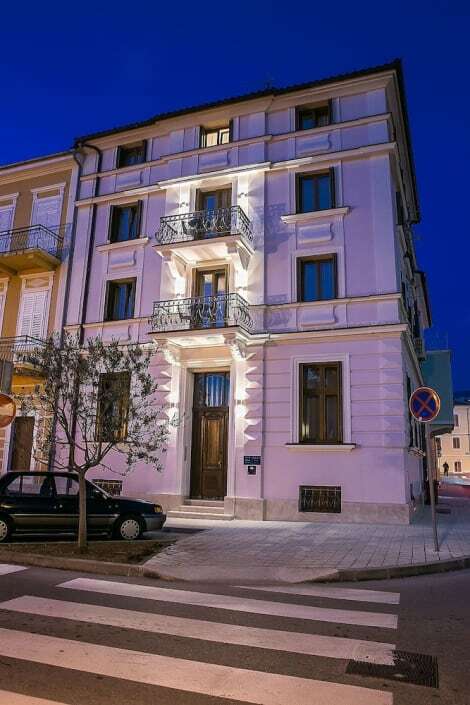 This 4-star hotel is 1 mi (1.7 km) from Crikvenica Town Museum and 1.2 mi (1.9 km) from Church of St. Anthony of Padua. lastminute.com has a fantastic range of hotels in Crikvenica, with everything from cheap hotels to luxurious five star accommodation available. We like to live up to our last minute name so remember you can book any one of our excellent Crikvenica hotels up until midnight and stay the same night.